Grooming your pug can be a handful. But having a trusted and top notch dog groomer that you can take your pug to can make all the difference. 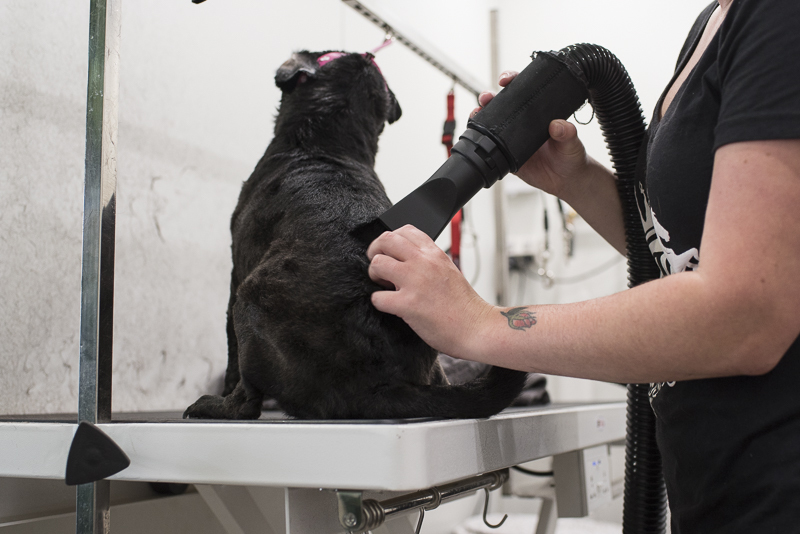 There are usually quite a lot of options when it comes to dog groomers. You can have one come to your home or you can take your pug to them. It’s all personal preference and you may find leaving them at a groomers daunting. 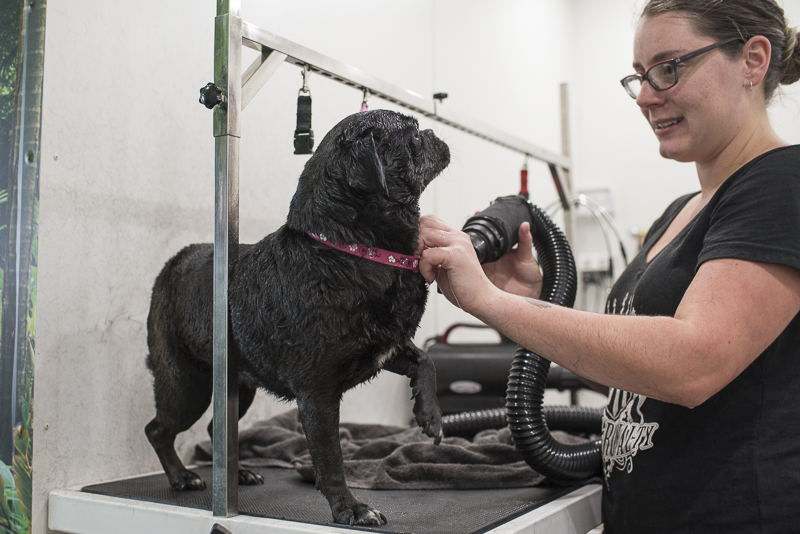 Here’s your chance to get an idea of what to expect when taking your pug to a groomer with some behind the scenes photos and tips. The first thing you should notice when you walk into a groomer’s salon is that it is a clean, tidy & safe environment. 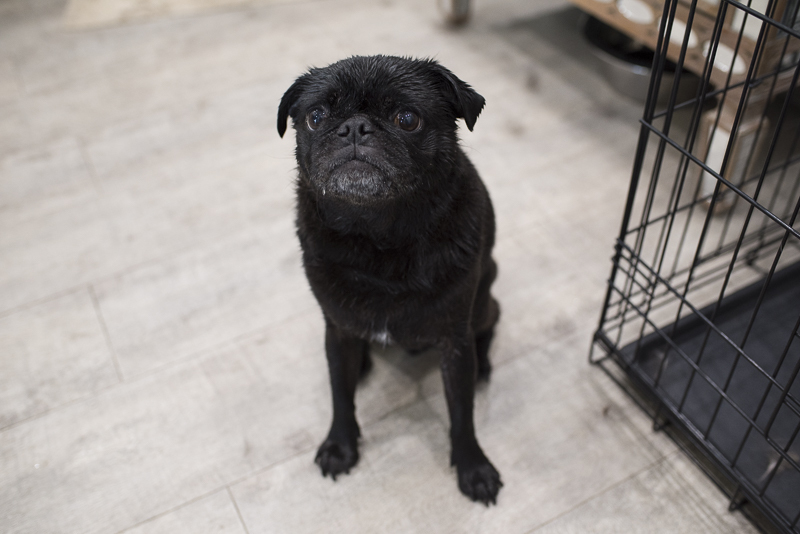 Floors, baths, tables and surrounds will be clean so you know that there is minimal chance of your pug having an accident whilst at the groomers. All tools and treats are out of reach of your pug to prevent any injuries or overeating on treats. 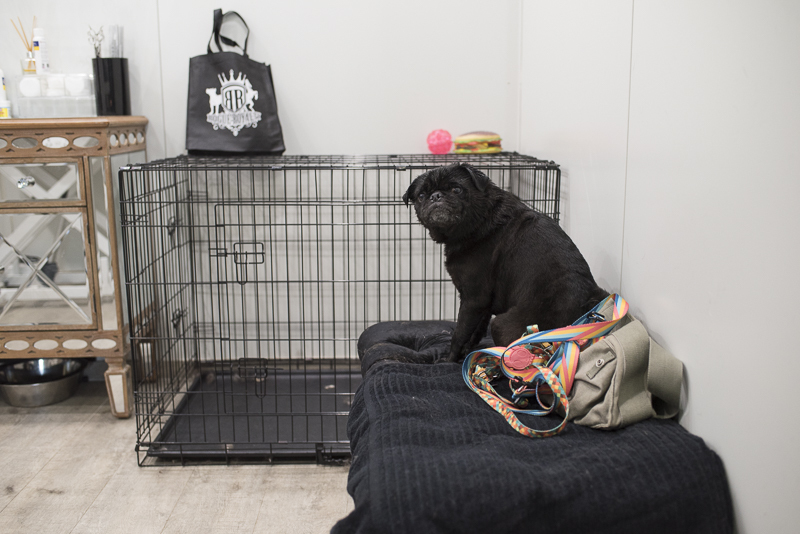 Most grooming salons cater for multiple dogs at a time so to ensure that each dog in their care is safe, there will be crates and pens for them to relax in whilst waiting for their turn to be pampered. 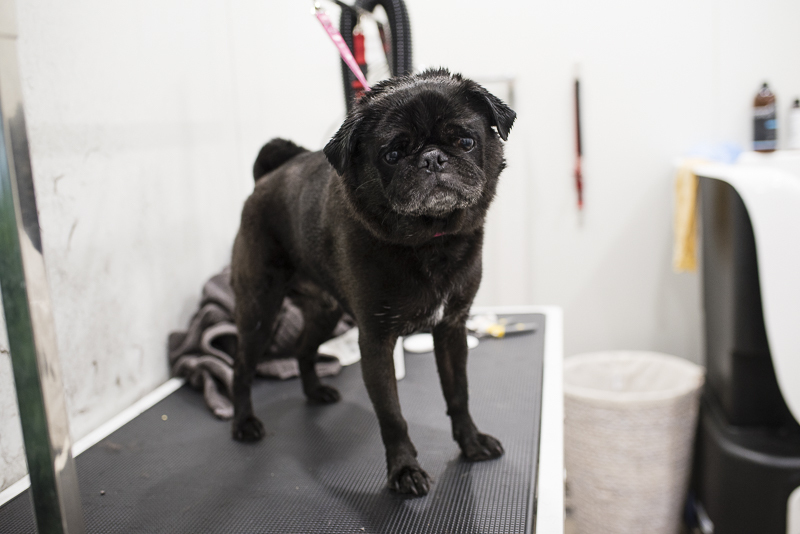 Part of having a safe environment for your pug to be groomed is for them to feel relaxed whilst they are there. 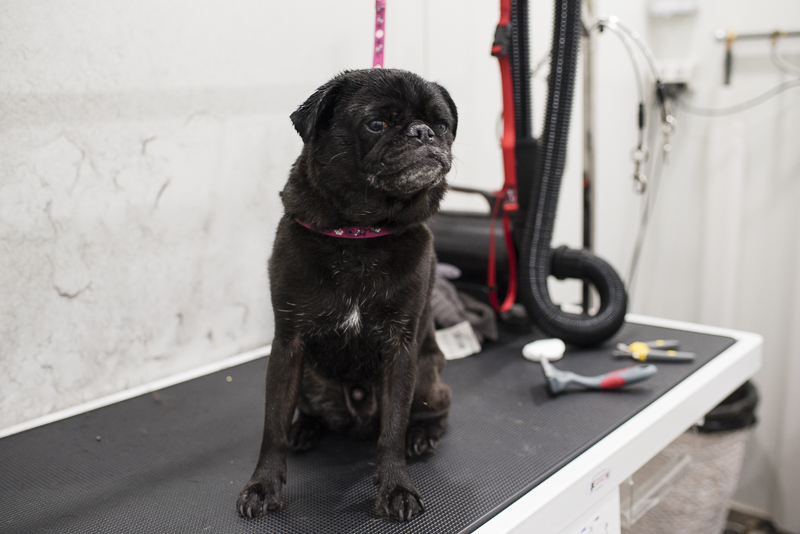 If the groomer is calm & relaxed, that will pass onto your pug and help the process of being groomed. The tools that a groomer uses can be the difference between a good groomer and a great groomer. 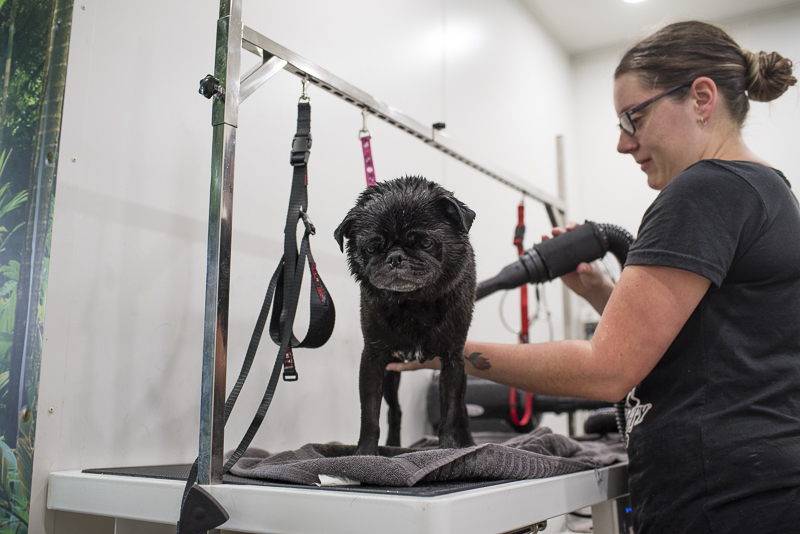 You want them to have the best tools of the trade that will help them to provide the best grooming experience for your pug. A soft brush and a deshedding tool are a must have on hand for grooming pugs to ensure as much as possible of their loose coat is removed. 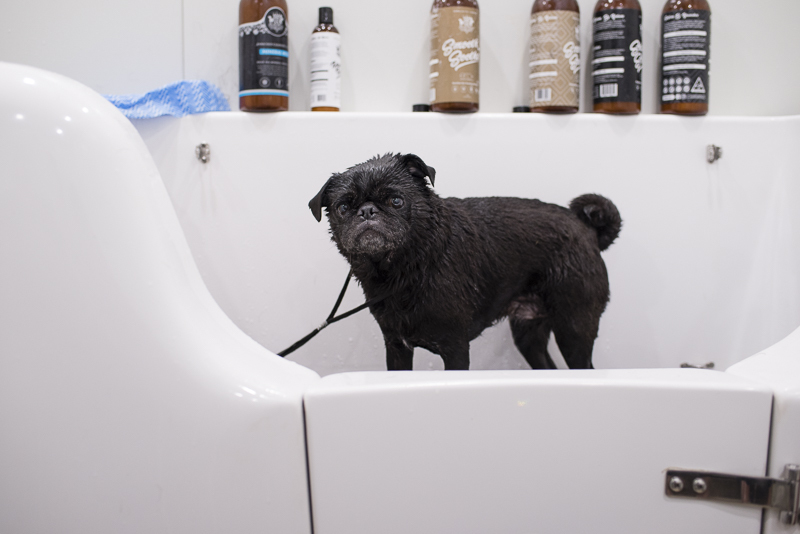 The bath tub should be safe so your pug cannot get out during their bath. 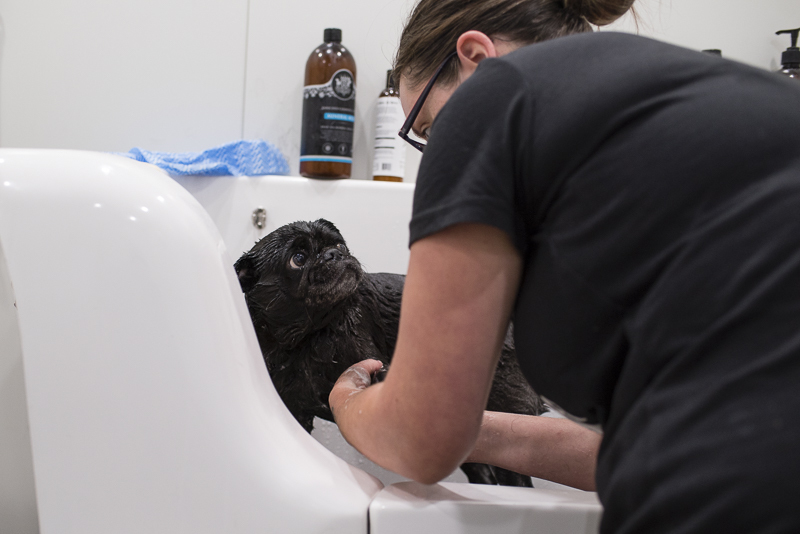 There will be a slip lead & collar in there to help keep your pug still without running the risk of hurting them or missing a spot during their bath. A grooming table with slip leads & collar attached to ensure your pug is safe whilst the rest of their grooming occurs. Good quality nail clippers or a Dremel will be on hand to trim those nails. Quality shampoo & conditioner are a must in any groomers salon. Be sure to ask to see what they use and check the ingredients to ensure it won’t harm your pugs skin. A good quality all natural shampoo & conditioner are the best to look for. Starting all of this from when you bring them home will not only making grooming them at home easier but when you want to take them to the groomer, the whole experience will be much more pleasant for everyone involved. 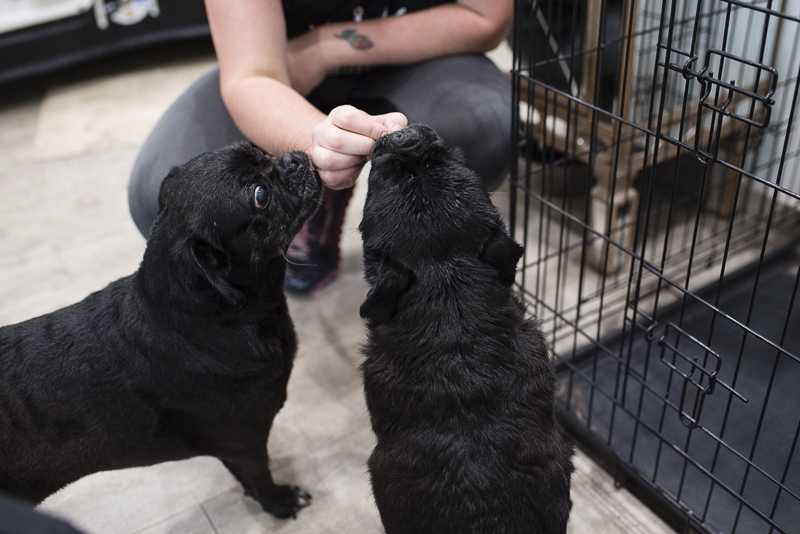 If you have a pug puppy, consider taking them as early in their life as possible, after their core vaccinations, to create a positive experience with the groomer. 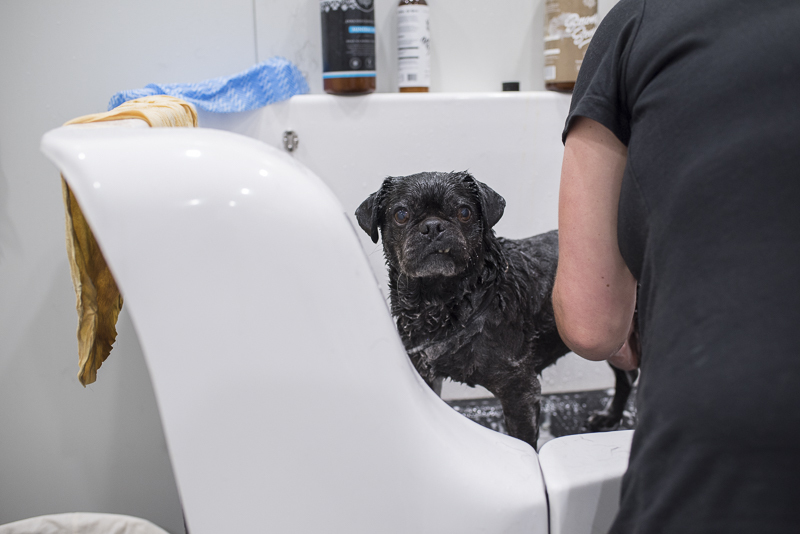 If you have a rescue pug who needs a good bath when you adopt them, taking them to the groomer can be a good fresh start for them without any possible trauma being associated with their new home. 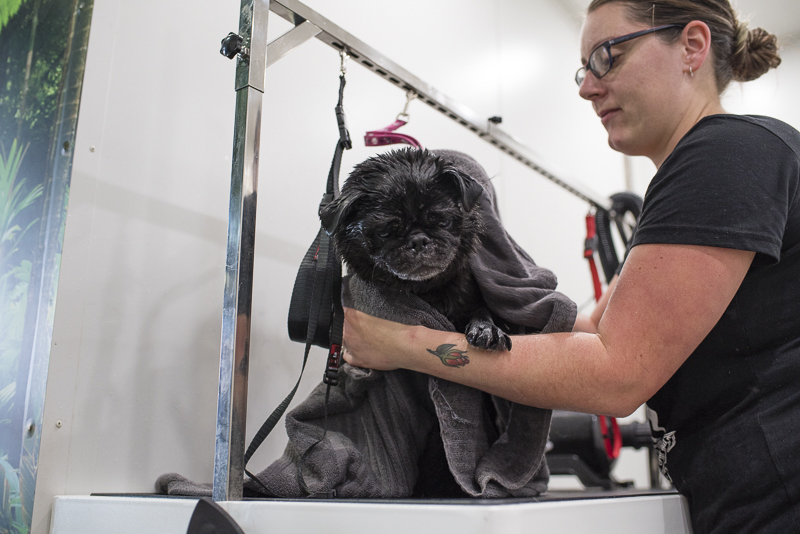 If you have never done so, I hope you find this helpful on what to expect when taking your pug to a groomer. 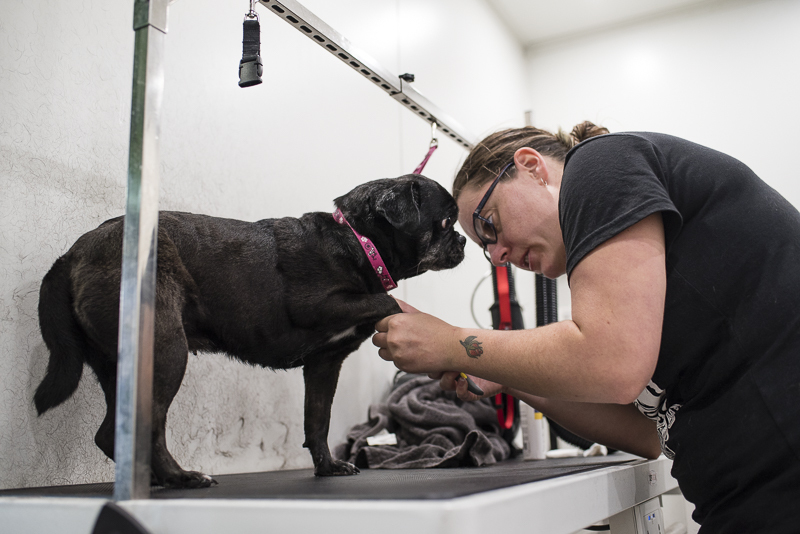 It can be a great experience for both you & your pug to have them professionally groomed. A very big thank you to Ecospa Natural Dog Grooming for allowing me to take some photos of Ref & Serina at their grooming session. 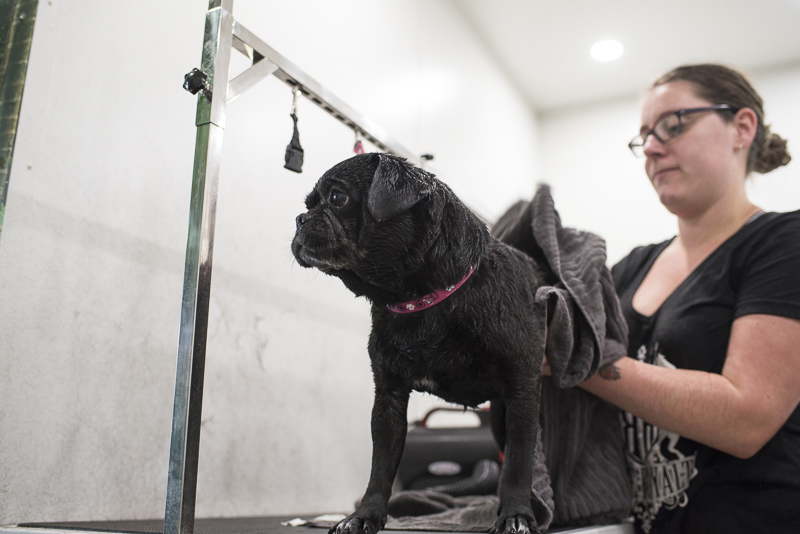 Ecospa Natural Dog Grooming are located inside Rogue Royalty and use their own naturally formulated shampoo & conditioner on all of their clients. Make sure to look for mats on the floors and in the tubs so that the dogs can slip while in the tub or being led from station to station. Also don’t forget to check for any required licenses. Never hurts to be to careful. Thanks for a great article. Absolutely great points Linda. All leads back to a safe environment. And you can never be too careful.